We at Kiyan Optometric are pleased to provide our patients with an advanced digital retinal exam called Eye Screen is a high-resolution screening photograph of your retina that will help us document, review and compare your retina over time. 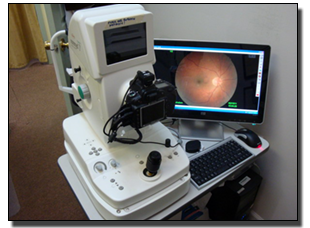 We will use the Eye Screen exam to document your retinal image for our charts, screen for eye diseases and improve our ability to view your internal retinal health at a much higher resolution than a slit lamp or ophthalmoscope. The Doctors of Kiyan Optometric are concerned about retinal problems such as macular degeneration, glaucoma, retinal holes, detachments and diabetic retinopathy (all of which can lead to partial loss of vision or blindness). Additionally many symptoms of systemic disease such as diabetes, the effects of high blood pressure and other diseases can be detected with the Eye Screen examination. The initial screening will provide us with a base line view of your internal retina so we can watch and monitor changes in your vision through the Eye Screen process and routine eye exams. Since insurance will not pay for the Eye Screen exam or any retinal imaging unless eye disease is present, the Eye Screen exam is an out of pocket expense. An annual eye wellness EyeScreen Photograph. A permanent record for your medical file, for serial analysis, comparisons and diagnosis. To be fast, easy and comfortable.